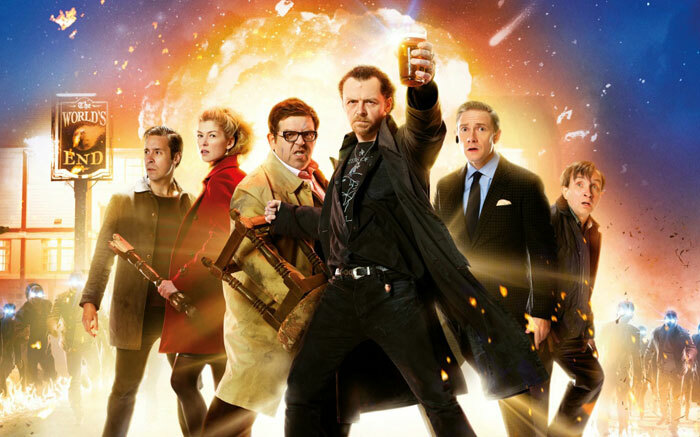 Three spoof musketeers, Simon Pegg, Nick Frost and Edgar Wright, are back in 2013, bringing The World's End to the big screen which will definitely rekindle your restless heart. With the release of this inventive, humane comedy, they finally complete their classic funny series - Blood and Ice Cream Trilogy: Shaun of the Dead, Hot Fuzz and The World's End. From the impressive Shaun of the Dead in 2004, brutal and bloody Hot Fuzz in 2007 to the most anticipated The World's End, wrinkles have overspread their faces but the movie still proves their intelligence, creativity, passionate and forever-young heart. Just take the beer and enjoy this brainstorming movie with booming enthusiasm. This film tells a story of 40-something Gary King (Simon Pegg) who is obsessed with alcohol, leading him to descend into a life of drunkenness and waste. But he still attempts an epic pub crawl - gulping down all 12 New Haven pints that he failed with his five childhood friends in his youth. When this thought flashes across his mind, he immediately decides to reunite the old gang, including Andrew (Nick Frost) and three other friends starring Martin Freeman, Paddy Considine, and Eddie Marsan. But things have changed in New Haven. When darkness is coming, more and more weird things occur. They seem to be drawn into some supernatural events. Will these guys fight for their freedom and manage to escape from New Haven? As the final installment of Blood and Ice Cream Trilogy, The World’s End is the film you should not forget to list on your movie collection to memorize laughers Simon Pegg, Nick Frost and Edgar Wright bring to us. It could be a great pity if you missed this great film in the theatre, but you can still enjoy its DVD with your buddies at your home. It would be better that you can backup DVD The World’s End to your PC and convert DVD The World’s End to portable devices so you can watch it anywhere and anytime. Is that hard to do this task? 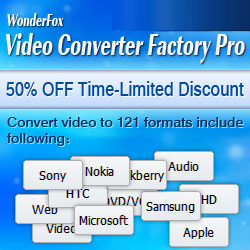 If you have WonderFox DVD Video Converter, it would be as easy as eating a pie. The following part will introduce you how to backup and convert this DVD movie easily and quickly. If you want to rip and backup DVD The World’s End you already have, the very first thing you need to conquer is to find a helpful DVD ripper and converter. Here we introduce you a good solution to do it – WonderFox DVD Video Converter, which is a powerful video converting program that can help you rip The World’s End to your hard drive regardless of any DVD encryption embedded in DVD The World’s End and enables you to convert DVD files to any video format you need. With this professional program you can better watch it on your PC, iPhone, iPad, Samsung Galaxy series and other portable devices. Then we will teach you how to backup DVD The World’s End step by step. Download and launch WonderFox DVD Video Converter. Then click “Load DVD” button to import DVD movie The World’s End to the program. This program will bypass any encryption embedded in this DVD and detect main title as well as basic information of this DVD automatically. Select the output format or device you want for output. More than 150 video formats are provided for you. You can use WonderFox DVD Video Converter to backup your DVDs and also use it to rip/convert DVD The World’s End to MP4, AVI, MOV, AVC, MPEG, WMV, TS, optimized video formats for iPhone 4S/5/5S/5C, iPad 4/iPad Mini, iPod, Samsung Galaxy, Google Nexus 7, HTC One and other portable devices. Here you can choose any movie title to convert, specify the Output Folder, merge/crop/trim the video before conversion. Next, press “Run” button to start ripping the encrypted DVD The World’s End to your PC. After conversion, you can share your DVD movie with your friends and play DVD The World’s End on iPhone, iPad and other portable devices you have. Or ask us via Facebook & Twitter to get a fast response.